Rain chances today across the Cookeville area. Highs around 82°. Can't rule out some overnight fog developing and may see the fog become dense in areas by sunrise on Thursday. The afternoon highs for Thursday through Sunday will go from 87° to as high as 92° by both Saturday and Sunday (near 97° in the vicinity of Nashville). Only a very slight chance of a popup thunderstorm over the weekend. This will be the hottest weather since the middle part of June. Big thunderstorms last evening. Saw some statistics that indicated as many as 15,000 lightning strikes in a 30 minute period over Middle Tennessee. Several storm damage reports here. We were spared the heavy rains here in Cookeville where only .05" was recorded at my location. Looked up some rainfall numbers, from CoCoRaHS, near Louisville, KY where several sections of the city, including the famous Churchill Downs racetrack were under water due to flooding yesterday. They range from just over 3" up to 5.62" and most of this fell over a very short period of time. Coverage from WHAS television. I've gotten this question several times and it is answered at the Message of The Day from the CoCoRaHS website...Where can I purchase an "Official CoCoRaHS 4" Diameter Rain Gauge"? Great Question. We ask all of our CoCoRaHS volunteers across the country to use the same type of rain gauge to standardize our measurements and get the most accurate data we can. That gauge is the "4-inch diameter high capacity rain gauge", which measures to the one hundredth of an inch and holds up to 11 inches of precipitation. Our studies have shown that this (and the NWS 8" diameter gauge which can cost hundreds of dollars) gauge is the most accurate for measuring precipitation, especially intense rainfall and measuring snow. So where can I obtain one? 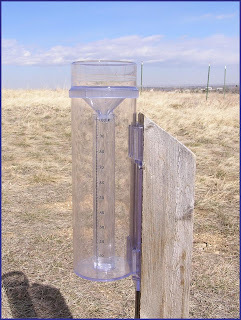 There are two rain gauge distributors offering our gauge at the special price of $23 plus shipping. Those are: WeatherYourWay (www.weatheryourway.com) and Ambient Weather (http://www.ambientweather.com/strgloteprra.html). The turn around time on orders is very fast. There are other distributors out there on the Web and some local hardware stores might carry the gauge as well, but we can't guarantee this low price (we have seen the gauge advertised for as much as $59.00 or more). On this date in 1954, it is the 27th day in a row that Nashville hits 90+ degrees, it is also the 58th day out of the last 59 over 90°.